Special Containment Procedures: SCP-018-DE is to be stored in a Class 4 locker equipped with alarm systems. The locker is gas-tight and, as a precaution against unauthorized access, is flooded with the highly toxic and mask-breaking security-gas G/232SFD-E, which is removed in case of authorized access. Admission to SCP-018-DE requires approval by O4-4. The room is kept under surveillance using CCTV cameras lacking microphones, which are monitored by two independent, illiterate guards, incapable of lip-reading or any sign language. Guards are to remain unaware of the content and effect of SCP-018-DE. If they detect an unauthorized access attempt, they are to release G/232SFD-E into the room in which the locker is located. Unauthorized personnel in possession of SCP-018-DE are to be terminated instantly and without making any prior contact. SCP-018-DE may only be transported by a remote-controlled robot. Unauthorized use of SCP-018-DE is to be prevented by any and all means. Description: SCP-018-DE is a piece of paper which has been cut approximately to an A5 format using scissors. 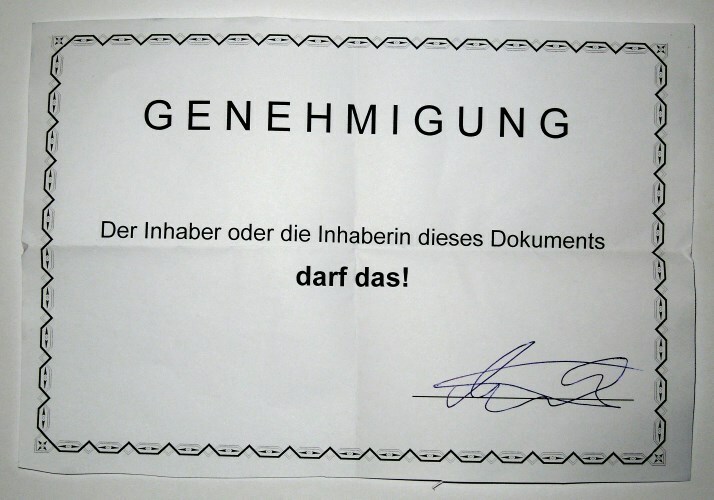 It is printed with text in German declaring that the owner of the Object "may do that"1. It contains no evidence as to either the creator or source of the object. The signature is indecipherable. The reverse side of the object is blank. If the individual in possession of SCP-018-DE is asked to justify themselves or is caught committing a crime and shows SCP-018-DE, all people within four meters become convinced that the possessor of SCP-018-DE was authorized to act as they did. This effect also manifests in people who become aware of SCP-018-DE's content within ten minutes, be it via radio, media or by being told so by other affected. This effect is permanent and only reversible by the administration of amnestics. Affected individuals will try to justify the act to those not affected, and even attempt to protect the culprit with their lives and by using deadly force. The urge to protect the possessor of SCP-018-DE rises with the degree of contempt by authorities, media and the general public for the subject. If SCP-018-DE is stolen or lost, the effect on all individuals affected by the possessor vanishes within 48 hours, and they become aware of the severity of the possessor's crimes, as well as their own. In the event that the former possessor regains possession of SCP-018-DE, it can be used again. If it is regained before 48 hours have elapsed, the effect persists among all individuals still affected. If SCP-018-DE is voluntarily relinquished to somebody else, the effect also persists. A person gaining possession of SCP-018-DE will promptly become aware of its primary effect and feel an urge to use it. 1. "G E N E H M I G U N G - Der Inhaber oder die Inhaberin dieses Dokuments darf das!" "P E R M I T - The owner [male] or the owner [female] of this document may do that!"